You get not only the stamp sets and thinlits, you’ll also get the Designer Series Paper, Cardstock Pack, Tassels, Stickers, and 3 New In Colours! 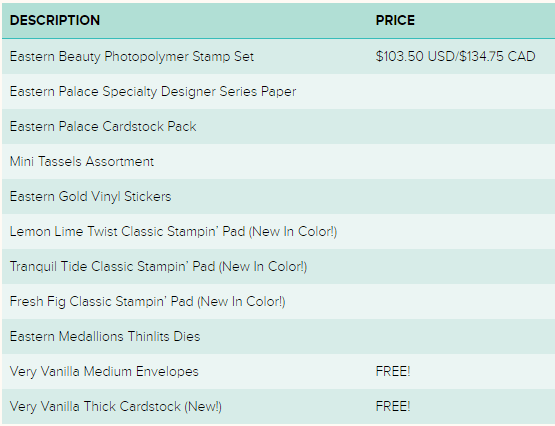 Plus – 2 free items – a package each of the Very Vanilla Medium Envelopes and the NEW Very Vanilla Thick Cardstock! I’ve been having fun creating with the new bundle. I made this new card today. This card highlights the new In Colour Fresh Fig. I love this colour – it reminds me of the retired Blackberry Bliss ink, although not quite as dark. The great thing about these thinlits is that there’s almost innumerable combinations of layers that you can make. For this card, I used 2 thinlits, both which cut out the petal shapes. After die cutting with the Big Shot and the Eastern Medallion Thinlits using the Precision Base Plate, I stamped the sentiment in the bottom corner in Versamark and Fresh Fig ink, covered it with Clear Embossing Powder and used the Heat Tool to emboss it. On the Fresh Fig cardstock, I stamped the small petal shape in Versamark ink and repeated the embossing process. 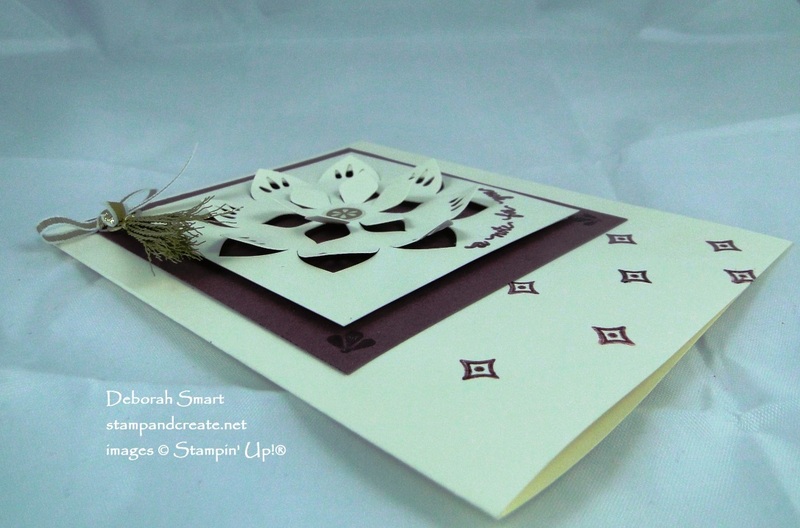 I did the same with the diamond image stampe on the bottom of the card front. I layered this piece of Very Vanilla cardstock over a panel of Fresh Fig cardstock, popping it up with Stampin’ Dimensionals. Isn’t it great how you can create such dimension with the die cuts?! The 1/8″ Ribbon in Gold, a Gold Tassel and the gold Vinyl Sticker in the middle of the die cut, finish off the card perfectly. 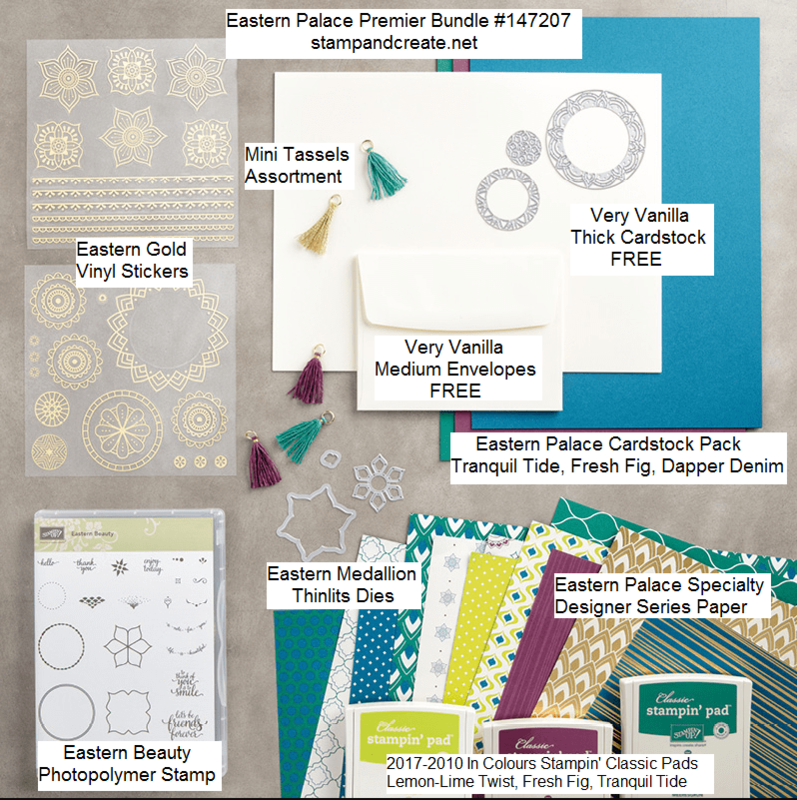 As a ‘thank you’ to you for purchasing the Eastern Palace Premier Bundle from me, you will be invited to a FREE CLASS where we will be creating 3 cards, using the supplies in your bundle! You bring your bundle, and I’ll supply the adhesives, ribbon and step-by-step instructions. If you’re not able to attend in person, I will email you the instructions! And if you purchase the Eastern Palace Starter Bundle, you can still attend the class, for the small fee of $10. 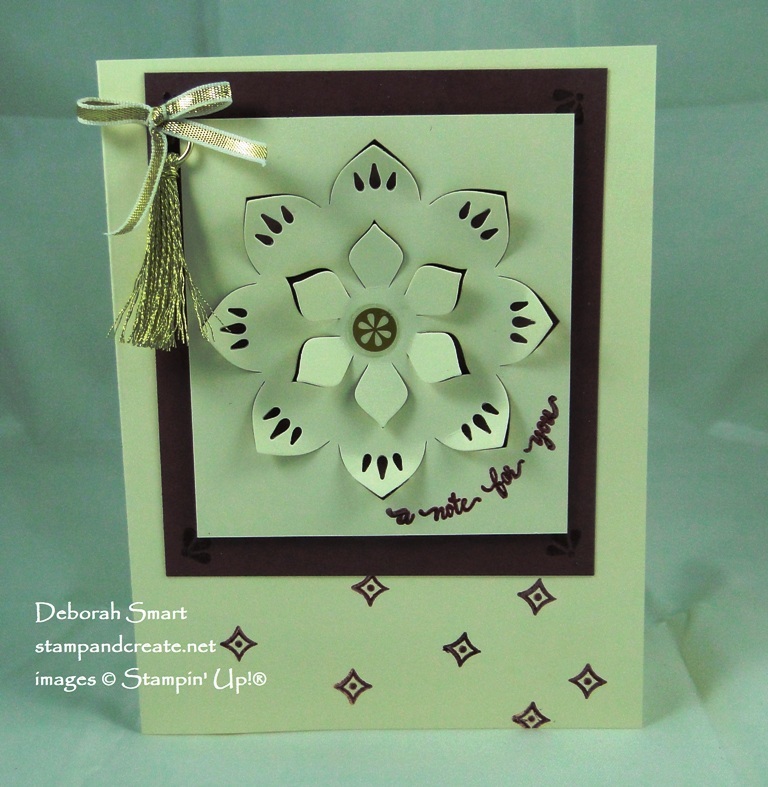 You’ll be able to use my Eastern Medallion Thinlits, ribbon, adhesives and receive the step-by-step instructions.